Exhumed from our basement recently was an old bottle of Saba. Chris came upstairs with it and asked, "can we drink this thing or what?" No! That's my bottle of Saba, which I bought to make with foie gras, well, at least a decade ago. Having a basement in an old house like ours is both a blessing and a curse. Our closet space is very limited, but our unfinished side of the basement is continually sustained as a stockpile of stuff. Where else would we store our stuff if not for the basement? But oh how easy it is to put more and more stuff down there? Every once in a while, we go in earnest, to organize and clean out our stuff and more often than not, we come up with something that falls into the category of "I forgot we had that". 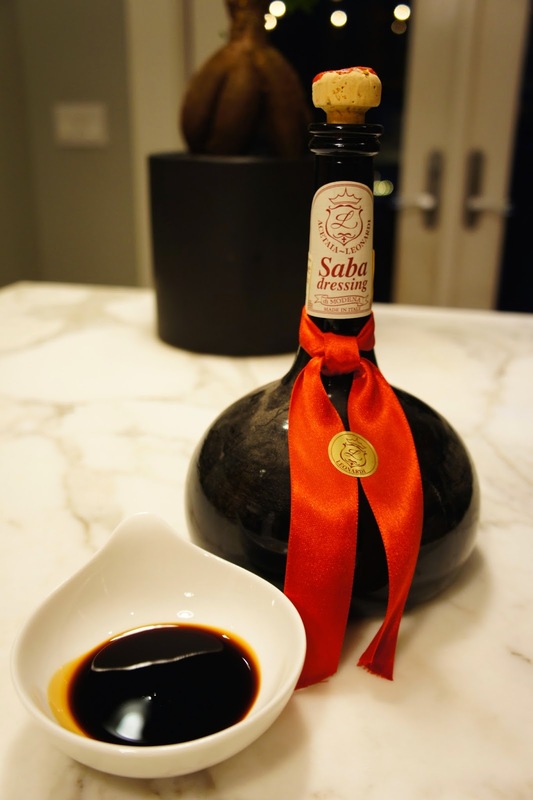 Saba is a sweet reduction of grape must, similar to balsamic vinegar, but cooked down even more. I suppose I purchased it with full intention to find a lobe of foie gras, do a little searing and make a fig and Saba sauce to drizzle over top. Yesterday, at Metropolitan Market, I came across a little package of foie gras and I did not pass it up. We are a family of foie gras lovers. I realize it can often be a controversial subject, so please stop reading now if you feel the urge to lambaste me for my love of foie gras. In the distant past, I have purchased a full lobe of foie gras, which at the time was about $100. It is something I certainly cannot afford to do often nor am I able to use it all in a timeframe where it would remain fresh. The small package from Metropolitan Market is just enough to give each of us a decadent treat. Season foie gras with salt an pepper. Sear the foie gras, seasoned side down, in a cast iron skillet, heated over medium high heat, about 30-45 seconds per side. Before you flip the foie gras over the first time, season the top with salt and pepper. Remove foie gras to a plate lined with paper towel to drain excess fat. In the same skillet, fry several pieces of sliced baguette until browned on both sides. Remove bread slices. Turn heat off and add 2 tablespoons of fig jam to the skillet, 2 tablespoons of Saba and a pinch of dried tarragon. Then add 3 tablespoons of butter and stir and swirl to combine the butter. The heat of the cast iron skillet is enough to go this 1 minute process with the heat off. I served the foie gras with an arugula and pear salad with a simple olive oil and Saba vinaigrette along with the fried toasts. The Saba was sweet and silky and held up to the long storage time. The foie gras, super rich and luscious! Welcome to the holiday eating season.